The Nigerian Professional Football League (NPFL) Match Day 7 will go on without the likes of Rangers International, Rivers United, Wikki Tourists and FC Ifeanyi Ubah who are all in for the preliminary stage of the CAF Champions League and the CAF Confederations Cup. 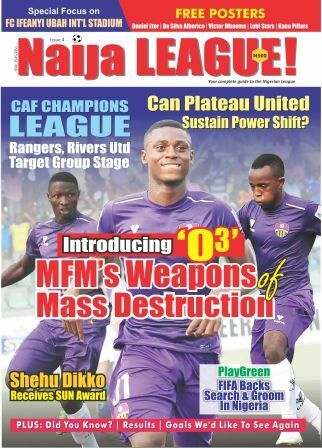 Notwithstanding, actions in Jos and Calabar will be of great interest to fans of Plateau United who are keen on continuing the unbeaten streak, while fans of Akwa United will hope on getting something out from their clash with Enyimba. Enyimba have yet to drop a point on their adopted ground, the U.J. Esuene Stadium, Calabar and their visitors, Akwa United need a point or maximum points in order to make amends for Abdul Maikaba’s poor league start. Out of a possible 18 points, the People’s Elephant have lost 8 and they occupy the 5th spot on the log, far away from their opponents Akwa United who are placed 19th and have managed to reap 6 points so far. Both clubs go into the Match Day 7 fixtures on the backdrop of contrasting results in the previous game: Akwa United won their first game of the season, against new boys Remo Stars, while Enyimba suffered defeat in the hands of El-Kanemi in Maiduguri. Last season, Enyimba beat Akwa United home and away, and one of the influential lads over both legs has switched allegiance. Christian Pyagbara who featured for Enyimba last season is now under the tutelage of Abdul Maikaba’s Akwa United. The pressure piling up on Maikaba can only be eased, for a while, if he can inspire his lad to a victory in Calabar, a city that has so much in common with Uyo than Aba.